“Viva La Commune!” was the slogan of the Revolutionary proletarians in the Paris of 1871. It went down in history as the exclamation made by the first proletarian rule which pervaded between March 18 and May 28, 1871. Another important heritage of the Paris Commune was the Internationale. These ideas of a “last fight” and the wish to “change the world’s foundation” in the lyrics of this song would step by step turn into a course of action utilizing constructivist elements and would be an inspiration for the people of the world until the era of totalitarian Orthodox Marxism. I’m authoring this introduction with the first impressions I got from the indicators that can be observed in Olgu Ülkenciler’s latest series of artworks titled “Das Fenomen.” First and foremost, these works contain a reality full of socialist symbolism and constructivist references. These references contain elements displaying the existence of social classes despite the claims made by the “so called” socialists, reformists and Marxist gourmets that there are no such classes anymore. The fact the hands of the working class as well as the black stars symbolizing youth, army, workers, farmers and intellectuals can be seen in all these artworks, encourages us to examine the current status of the proletariat. Despite the New Middle Class academicians and intellectuals, who claim that social classes no longer exist, Ülkenciler shows us that the class struggle is not over but that the method of the struggle must undergo a change in accordance with the changing state of affairs. The way potbellied bureaucracy and bourgeoisie are portrayed and the students and workers with their left fists in the air, reminds us how the Internationale was sung collectively, in different languages by workers of different nations. These workers have each become a modern day Zeus with the thunders they’re holding in their hands. It is now in their hands to recreate the world. Thus, Olgu Ülkenciler reminds us, who are going through an apolitical and cynical period, that an equalitarian, libertarian and solidarist world is still possible. If the geography we are living in is to one day be truly free, this will most certainly be accomplished by its workers, proletarians, farmers, students and intellectuals. This is symbolized in the representations of the comrades bearing images of red stars on their foreheads and never taking any step back no matter what others might say. Another important point here is that as the artist displays the current state of things, she describes what needs to be done without going into rhetoric of meta-discourse. The organizational structure, in which all social classes will protect their interests collectively, refuses the need for a leader or ruler and Ülkenciler sets forth this point in her works by using figures with indistinct faces. The goal is not the improvement of living standards but a fundamental alteration and improvement of our way of living. In some of the artworks, red stars slide down over certain surfaces and rain down upon social layers with the dream of a red sky. It is the crowds depicted with caricature aesthetics that has the power to accomplish this. The black fists on one side and the left fists on the other, symbolize a struggle led by the light of the anarcho-syndicalist and libertarian communist movements. 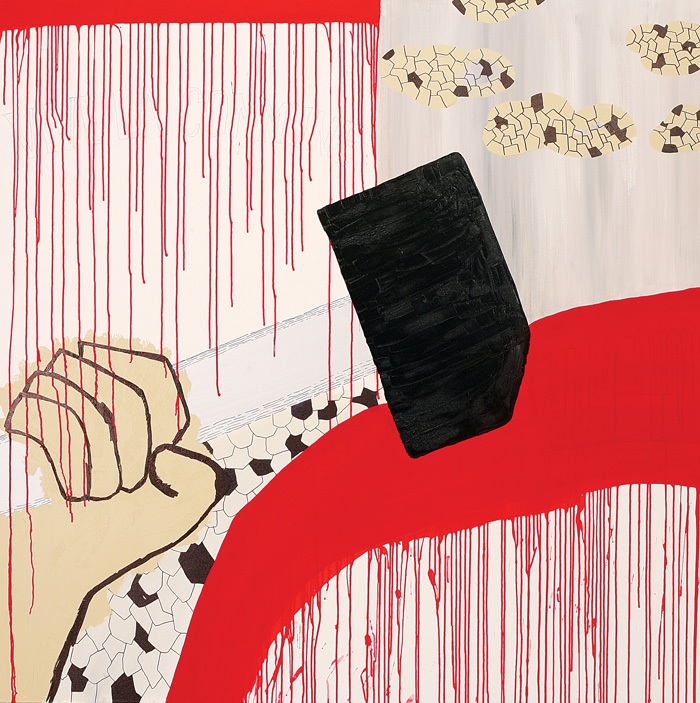 The moon and the star that connect with these fists at certain points and are portrayed upside down, convey to the viewers the geographies where a perpetual anarchy is required. The hammers in people’s hands portray the labor power of the workers and proletarians and the longing for a self government of the people despite the elitist socialists or so called reformists. This discourse, which comes from the heart, and the labors of the people can change the world. Ülkenciler, who uses many different materials together in her artworks, created these works using a mixed technique, which also contains certain elements of poster aesthetics. Her works herald us a sky painted in black and red. This can also be interpreted as an invitation for color symbolism or for a rebellion that will be carried out under a Red & Black flag. 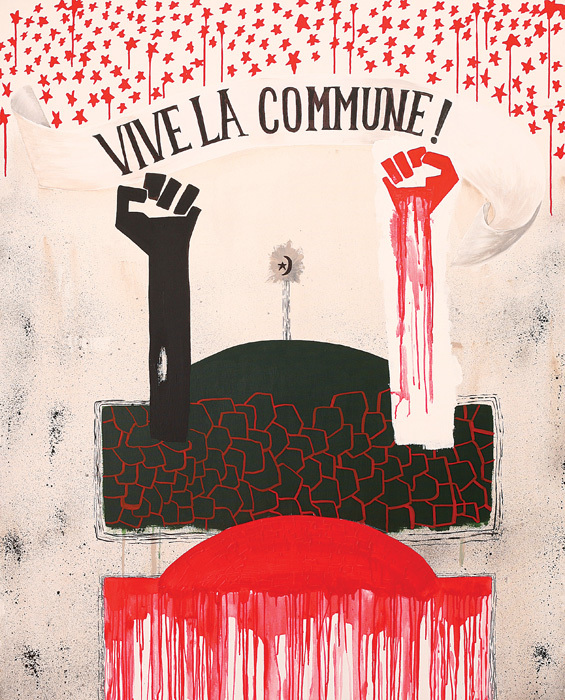 The artist points out that, concrete and perceivable class struggles still persist in our age and she brings a slogan from the past to our current day: Vive La Commune! The above essay has been published in the catalogue for Ülkenciler’s latest exhibition of the same title. Posted in content, on artists and tagged C.A.M., Das Fenomen, Fırat Arapoğlu, Olgu Ülkenciler, Viva La Commune!. Bookmark the permalink.